An asphalt driveway or parking lot doesn't last forever. But you can make it last longer by calling Duval Paving, LLC for professional asphalt sealcoating. Sealcoating adds a protective sealant to an asphalt surface to guard against harsh weather, hazardous chemicals, and every day wear and tear. 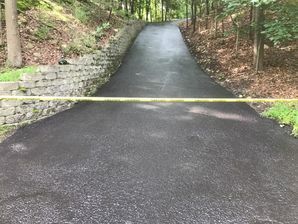 More importantly, asphalt sealcoating minimizes the potential for cracks and potholes, to keep your driveway or parking lot safe for everyone. Call Duval Paving, LLC, the asphalt sealcoating experts. We've been in the paving business since 2011. Because asphalt is petroleum-based, gasoline, oil, antifreeze, and road salt can eat away at it. Asphalt is also naturally porous. Once water penetrates an asphalt surface, it leads to erosion. During cold weather, freeze/thaw cycles will result in ridges and frost heaves. Sealcoating provides a protective coating against these harmful agents along with every day wear and tear. All of our residential sealcoating jobs are applied by hand to ensure there is no overspray on your grass, walls, walkways, or garage doors. Call Duval Paving, LLC for professional sealcoating to protect your asphalt surface and make it last longer. If your kids like to play basketball, roller blade, or ride bikes on your driveway, you want to make sure they are safe. Protect your family and your driveway with a professional sealcoat application. A smooth driveway is a safe driveway. Duval Paving, LLC recommends sealcoating your asphalt surface every three to five years. Call (904) 201-2161 to enquire about our maintenance plans. We've been sealcoating residential and commercial asphalt surfaces for 8 years. Make your asphalt last longer. A properly sealcoated parking lot or driveway is much easier to maintain. It's also safer for your family, visitors, and clients. Call (904) 201-2161 for quality asphalt sealcoating. Duval Paving, LLC will get the job done right.